One quarter of 214 million m3 of wood harvested in Russia is exported to China. 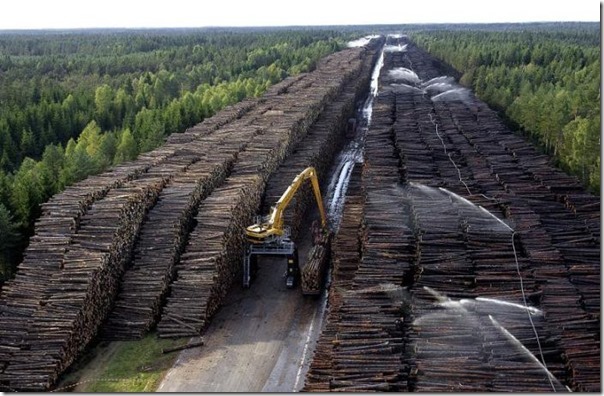 In Asian Russia most logging is driven by signals from Chinese market. Facing growing demand for wood and shortages in domestic supply, Chinese authorities are pushing for greater imports from Russia, ignoring the fact that its neighbour will cease to be a reliable supplier within a decade. On the website of Jiagedaqi, a city in China’s northern Heilongjiang province, an advertisement promoting investment in the Amazar Pulp and Saw Mill project, which lies a short distance across the border with Russia, proclaims that, "Russia possesses one quarter of the world’s forests with enormous underutilised wood resources." Nowadays, mature forests in Russia are scarce and the authorities are running out of logging concessions for new export-oriented enterprises. Some areas bordering China are even experiencing shortages of construction timber for local needs. There are no accurate figures on Russia’s forest resources due to outdated inventories, but at least one million hectares are cut down annually according to Greenpeace Russia, and much more is lost to burning. But it’s not just China’s supply of timber that’s at stake. Rampant deforestation in Russian border provinces also threatens China’s efforts to create an "ecological civilisation". Destruction of transboundary ecosystems negatively affects local climate, shared watercourses, migratory wildlife populations and prospects for environmental tourism and a "green economy". Many on the Russian side of the border are increasingly anxious about the situation. Dozens of petitions calling for wood exports to China to cease have been organised, with mass protests also taking place in 2017 and 2018. Some of these efforts are paying off. On May 11, at public hearings held in the Zakamensky district of the Buryatia Republic, citizens rallied against allowing Chinese investors to lease 86,000 hectares of primeval larch forest. Instead, they created a Citizen Council for Forest Control to ensure public oversight of the forestry sector and to support the protection of their forests. Strong demand for wood from Asian countries has persisted for the past 25 years. as early as in 2006, China already imported 12 million cubic metres of timber just from the Russian Far East. But the devastation of Russia’s forests started in the Soviet period (1922 -1991). The greatest problem is that Russia still practices "forest mining" in its primary forests, with forests being clear-cut unsustainably and left to regenerate naturally. One reason for this is that the country lacks capacity to engage in plantation forestry. Management of forests has declined following repeated reorganisation of the State Forest Service, reducing ten-fold the number of foresters on the ground in the past 15 years. However, this largely domestic mismanagement is being framed as a Chinese threat due to the scale of demand from across the border and the unresponsiveness of Chinese companies on the issue. 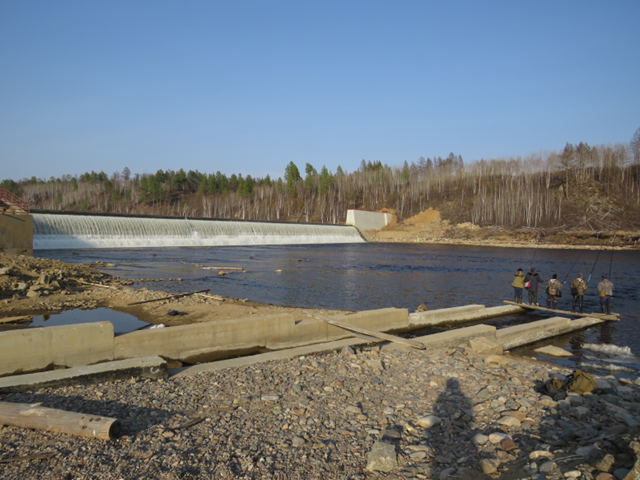 The complex relationship between the Russian and Chinese forestry sectors is reflected in the case of the Amazar Pulp and Saw Mill (APSM) – the single most controversial forestry project in Siberia. 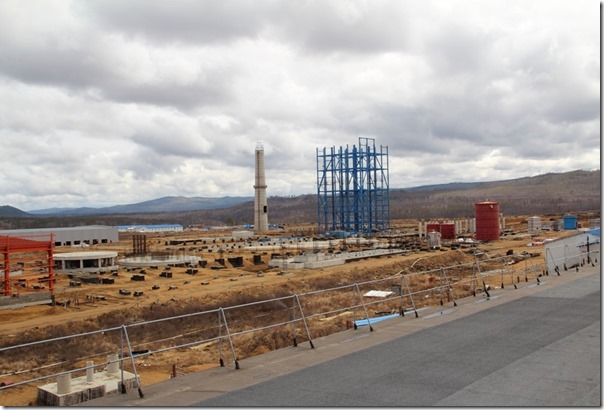 APSM is being built in Zabaikalsky province, 87 kilometres from the Chinese border. It consists of a pulp mill, two wood processing facilities, a reservoir on the Amazar River and an extensive logging concession. It is owned by Heilongjiang Xingbang Investment Company. 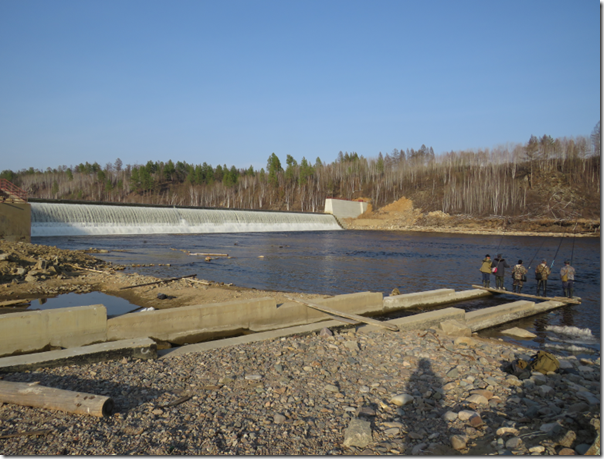 Started in 1999, the first joint forestry enterprise in Zabaikalsky province started extraction from primeval forests, with trucks transporting unprocessed logs through a seasonal border crossing on river ice at Pokrovka-Louguhe that was effectively controlled by private interests. Similar enterprises sprang up all along the Sino-Russian border, boosting the export of logs. This brought little benefit to Russia and sparked public criticism. A disappointed Russian government clamped down on the exports and urged their Chinese counterparts to process the wood inside Russia to retain a greater share of the value. This resulted in an agreement in 2003 between Zabaikalsky and Heilongjiang provinces to construct the Amazar Pulp and Saw Mill, which was supposed to start operation in 2007. During the following five years there was little progress as it remained more practical for forestry enterprises to export unprocessed logs of wood. More than two million hectares of forest were leased at that time by Chinese-funded logging companies loosely associated with the APSM. The crossing was finally shut in 2008 due to violations of Russian law and a corruption scandal, making log exports impossible. Since 2013 the project has received constant attention from civil society and various inspections, and in 2015 was investigated by the Russian Presidential Council on Human Rights. Since 2008 proponents of the APSM project have been pushing authorities to reopen the border crossing. In fact, with the announcement of China’s Belt and Road Initiative (BRI), some are now claiming that the crossing is a key part of the China-Mongolia-Russia Economic Corridor. There is no doubt that in this unpopulated and remote corner of China and Russia, BRI cannot serve any other economic activities but the APSM’s. The pulp mill is to produce 243,486 tonnes of unbleached pulp and up to 700,000 cubic metres of timber annually. This was halved from an original plan to produce 400,000 tonnes of pulp. So far the APSM has been granted a lease for 218,234 hectares of primeval forest along the transboundary Argun (Eerguna) River. Half of this forest area was previously reserved for the creation of nature reserves. Even if this biodiversity rich forest is cut, it could only satisfy 15-20% of the project’s needs. The Russian government gave this "priority investment project" tax breaks and a guarantee to provide a forest area capable of producing 1.57 million cubic metres of wood per year. However, other forest plots offered to APSM for lease have not been satisfactory because of their low-productivity. Besides the APSM yielded to popular protest and in 2015 refused to lease traditional areas of indigenous Evenke in Tungiro-Olekminsky district, where more than 1 million hectares were included in the original logging plan. APSM claims it needs 2.5 million cubic metres of wood per year, but current forest resources in a 200 kilometre radius will be hardly enough for ten years of its operation. In 2017, China issued the "Guidance on Promoting Green Belt and Road", which requires projects to ensure that overseas projects do not exceed the carrying capacity and resilience of local ecosystems. The APSM project is quickly becoming a key test case of this green commitment. The project costs 4.7 billion yuan (US$ 730 million), according to a recent advertisement, and needs additional investment. In 2010, APSM secured a loan of 2.4 billion yuan (US$ 370 million) from the China Development Bank and less than one billion yuan (US$ 160 million) raised from other sources. As projected construction costs have doubled, new attempts to raise funds have been made. Many Chinese businesses are looking to diversify their activities by purchasing assets along Belt and Road routes. One of these is sewing-machine manufacturer Zoje (ZJR), which is listed on the Shenzhen Stock Exchange. Zoje attempted to raise funds from shareholders for construction of the saw mill, envisioning a 60% stake in HXIC and further investment of more than one billion yuan into construction of APSM. In its long disclosure statement, Zoje did not articulate specific environmental and social risks, or present evidence of sufficient forest resource to sustain production. In May 2017, International Environmental Paper Network (EPN), a network of organisations working for sustainable paper production, and eight Russian and international non-governmental organisations petitioned the Shenzhen Stock Exchange and China Securities Regulatory Commission to investigate. In early 2018 the application was withdrawn by Zoje after failing to receive regulatory clearance. “This shows that the Stock Exchange applied a strict due diligence procedure and took the potential impacts of Chinese overseas investments on fragile boreal forest ecosystems into account,” stated EPN International in a press release. Non-governmental organisations are now calling on the project’s backers to learn a lesson from the failure to raise additional funds. Instead of looking for other financiers, they should first proceed with a comprehensive assessment of the risks and long-term viability of the project, and consider alternative options for economic development in the province. But this looks unlikely. Zabaikalsky and Heilongjiang provincial authorities have reacted by redoubling efforts to find additional investors and reopen the border crossing, which would allow timber exports of round wood to resume, creating revenue to complete the construction of APSM. However, the Office of the Russian President has promised to conduct a new environmental impact assessment (EIA) for the whole project. This is a step in the right direction but EIA procedures have also been severely weakened under President Putin, so a future assessment may not on its own guarantee greater sustainability. The APSM episode is a chance for both China and Russia to reassess the deeply held but misguided belief, typified on government websites such as Jiagedaqi city’s, that China can continue exploiting Russia’s forest reserves under the banner of Belt and Road cooperation. Aspirations to “green” the Belt and Road cannot be met if ten years from now there are no mature productive forests remaining along one of its key northern routes.